Today I’m back with a second Artfinder feature showcasing the exquisite paintings of Tuscany-based artist, Nicola Mountney. Nicola is an expert in Thangka painting, which is Tibetan Buddhist painting on cotton or silk appliqué. 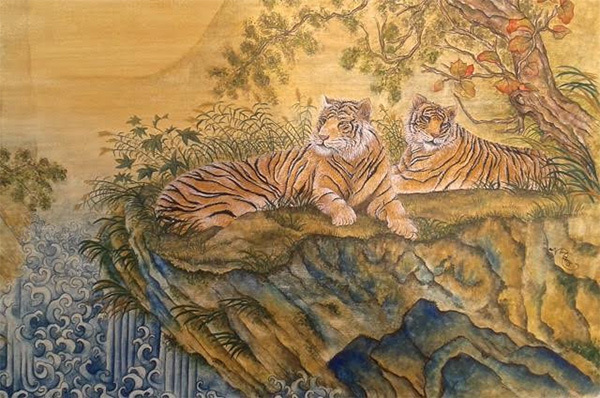 She took a rare opportunity to train under a Western Thangka Master and has developed a very special style of painting. 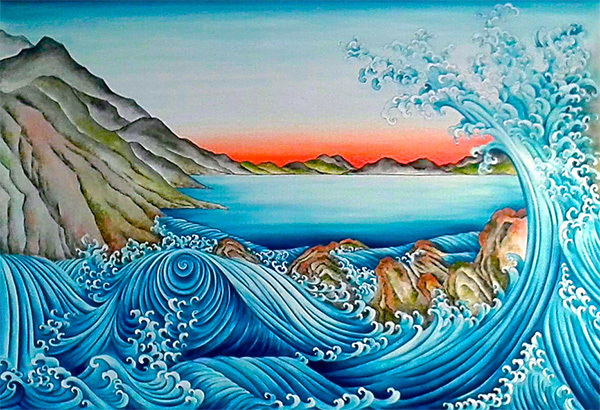 I especially enjoy the depiction of water in Nicola’s paintings, which is really quite stunning and serene. I recently had the opportunity to interview Nicola and learn more about her unique artform. I am pleased to bring you art expert Nicola Mountney for today’s Artist Spotlight feature. There are many strict rules and little artistic freedom in thangka painting. The drawing side of it is very technical and it takes many years to become accomplished. I spent hundreds of hours learning to shade using very particular techniques. You learn to train the eye to spot every single error in your work by repetitive line drawings and paintings. It’s not for everyone, but it meant a great deal to me. Below are two of my most recent paintings. 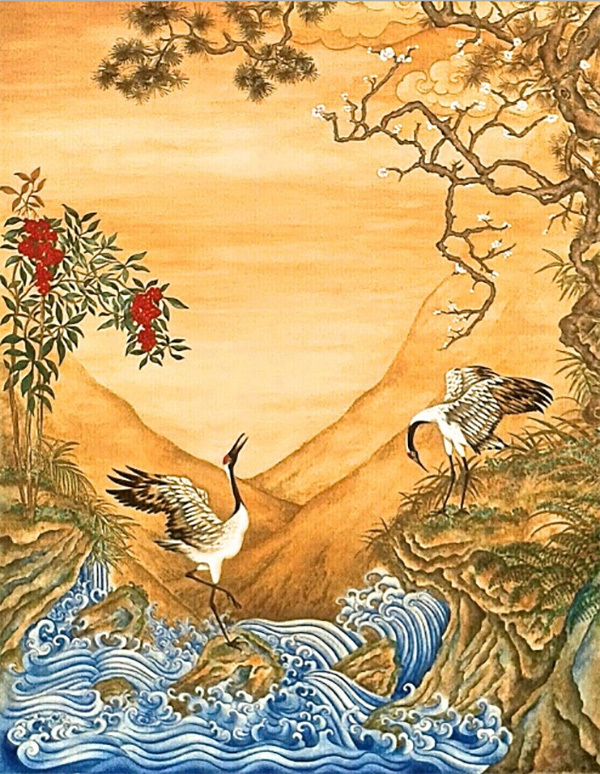 I’m particularly pleased with the detail on the tigers and the luminosity and smoothness of the landscape in the crane painting. The palette I use creates a peaceful, spacious atmosphere, and lends itself well to interior design particularly in contemporary settings. 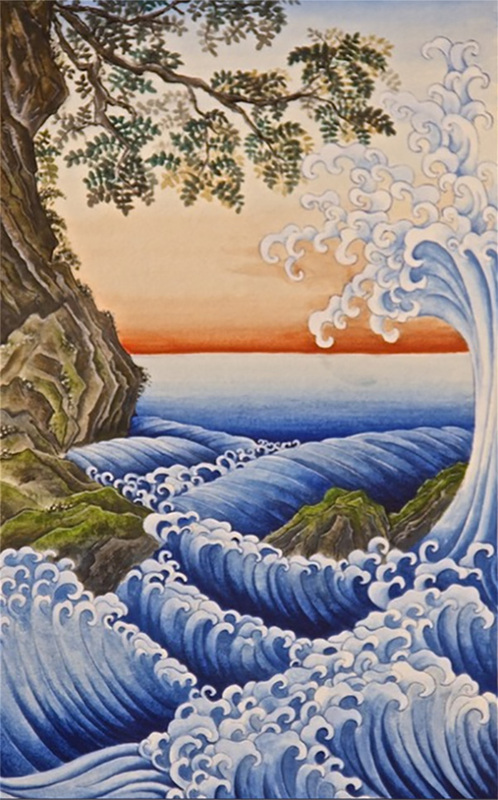 Once I moved away from the strict guidelines of thangka painting, I initially painted in miniature, but now the paintings have become much larger. I’m planning several triptychs (3-panel paintings) of landscapes and water. I also plan to use my work as a basis for textiles. I live in Tuscany, one of the most beautiful places in the world, so, I am never short of inspiration. A perfect day is sitting at my desk with paintbrush in hand and a cappuccino, listening to Bach whilst I work. 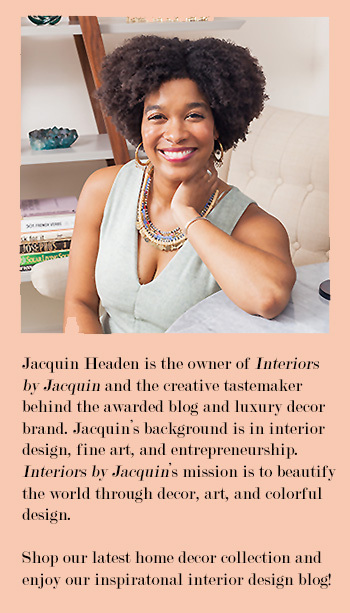 Thank you for sharing your beautiful paintings with Interiors by Jacquin. We look forward to seeing your artwork in textile form in the future! That really will be a treat, especially for designers. To see more of Nicola Mountney’s artwork for purchase, please visit her page on Artfinder. 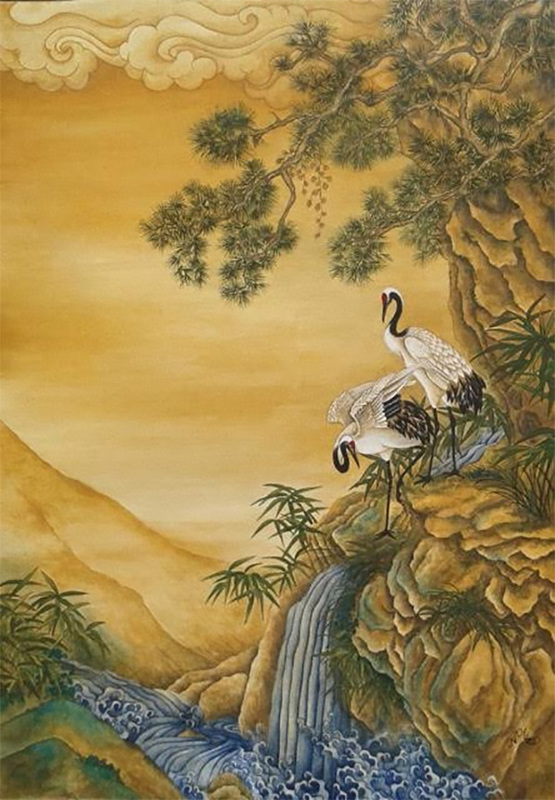 Nicola’s artwork would be a perfect way to bring a touch of chinoiserie to your home.